H Potter Pantheon Decorative Candle Lantern Patio Tabletop Candle Holder Indoor Outdoor. Rich with details from top to bottom. The H Potter Pantheon Lantern will light your nights with its dancing shadows of branches and adds a visual touch of style to your days wherever it is placed indoors or out. H Potter has been providing high quality garden products since 1997. We do not pretend to be the cheapest, but you get what you pay for. Our products are built to last. A WARM, WELCOMING GLOW FOR VISITORS - Lanterns not only enhance an environment but can offer a touch of elegant beauty to your home and garden. Uniquely designed with a heavy, durable construction, the H Potter pantheon lantern is perfect for alfresco dining and outdoor living. An ideal mood setter, this tabletop lantern offers a welcome glow, lighting up your summer bbqs and sheltering candles from the wind. 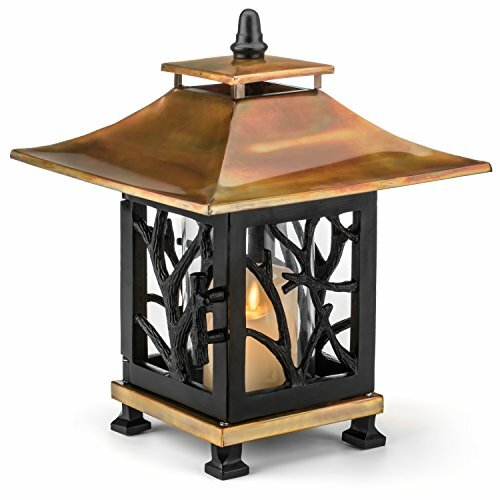 GLASS HURRICANE AND POWDER COAT FINISH - Durable stainless steel and aluminum construction with a black powder coat and rustic copper finish for aesthetic rustic appeal, this large lantern creates a dazzling effect on any patio deck or sturdy table. Complete with glass hurricane (candle not included) and designed to add character to your living space, the lantern top lifts off for a candle to be placed or simply open the front door. Designed for indoor or outdoor display. VINTAGE STYLE LANTERN FOR ALL SEASONS - At 14.25-inches tall by 11.5-inches wide, this decorative candle lantern will make a great focal point and impressive statement wherever it's placed. Unique and sturdy, the heavy weight makes it perfect for an outdoor setting, without the worry of it toppling over on windy days. If you're looking for something different, this beautiful lantern would make a perfect wedding decoration or birthday gift idea. HEAVY AND DURABLE IRON CONSTRUCTION - Built to last, this classic lantern showcases breathable top vents and hurricane glass set within an aluminum frame. Used night or day, stunning as seasonal decor beside the fireplace, on a side table for a soft glow or outdoors for a romantic dinner. Elegant enough to blend with any decor, a pillar or remote control candle will provide ambient reflection through the beautifully crafted metalwork. QUALITY BY H POTTER - H Potter has been designing and manufacturing premium quality garden products since 1997. We do not pretend to be the cheapest, but you get what you pay for. Packaged well, with stunning craftsmanship and backed by great customer service, we're proud to say our garden products are built to last. View More In Candles & Holders. If you have any questions about this product by H Potter, contact us by completing and submitting the form below. If you are looking for a specif part number, please include it with your message.